Measuring just 3 miles long and 1¼ miles wide Derwent Water isn’t the biggest of the lakes in the Lake District but it’s undoubtedly one of the most attractive. It stretches from the grassy banks of Crow Park to the north to the Lodore Falls at the south, surrounded on all sides by beautiful wooded fells. What’s more, it’s just a short walk from the centre of the bustling market town of Keswick. Derwent Water’s best known features are its tree-covered islands. St Herbert’s Island, at the centre of the lake, is named after Herbert of Derwent Water, a reclusive disciple of St Cuthbert who lived on the island in the 7th century. Derwent Island, the most northerly of the islands, was owned by German miners before being purchased in 1778 by the eccentric Joseph Pocklington. The new owner built an Italianate style mansion here, Derwent Island House, causing much distress to William Wordsworth who thought it spoilt the view. The island and house are now owned by the National Trust but leased as a private residence and rarely open to the public. One of the best ways to see the lake is on the Keswick Launch, a ferry service that runs right around the lake, calling at 7 stops en route. Services depart every 30 minutes in the summer with a complete circuit taking 50 minutes. It’s also possible to walk right around the lake. The 10-mile route is fairly easy, on flat and well-maintained paths, with much of it passing through beautiful woodland. 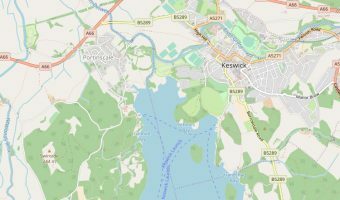 A more popular and shorter option is to walk to Friar’s Crag from the Keswick Launch landing stage at the bottom of Lake Road. It’s only ½ mile and well worth it. Friar’s Crag is a wooded peninsula on the north western shore of the lake and widely regarded as one of the finest viewing points in the Lake District. A monument to John Ruskin here reads ‘The first thing which I remember as an event in my life was being taken by my nurse to Friar’s Crag on Derwent Water’. The land is now owned by the National Trust and dedicated to Hardwicke Rawnsley, one of the organisation’s founder members. Another fine view of Derwent Water can be seen from Catbells, a fell on the western side of the lake. Alfred Wainwright described it as ‘one of the great favourites, a family fell where grandmothers and infants can climb the heights together, a place beloved.’ Most ascents start from Hawes End, one of the stops served by the Keswick Launch. There are numerous places around Derwent Water to hire boats and other watercraft. The Derwent Water Marina at Portinscale rents out rowing boats, kayaks, windsurfers, canoes, and sailing dinghies. Tuition is also available. The company also has a number of holiday apartments for rent. Other water sports companies based on Derwent Water include Platty Plus and Nichol End Marine. Rowing boats and cabin cruisers can also be rented from Keswick Launch. The Lodore Falls Hotel enjoys a magnificent setting at the southern end of the lake. It offers 69 en-suite bedrooms, a leisure club with indoor and outdoor pools, a bar and restaurant, tennis and squash court, gym, and beauty salon. Map showing location of Derwent Water. It’s possible to walk around Derwent Water in a day. The route is fairly flat and easy. If it starts to rain heavily you can just jump on the ferry at the next stop.